^ Felix H. Beijer, Huub Kooijman, Anthony L. Spek, Rint P. Sijbesma, E. W. Meijer (1998). “Self-Complementarity Achieved through Quadruple Hydrogen Bonding”. Angew. Chem. Int. Ed. 37: 75–78. doi:[[doi:10.1002%2F%28SICI%291521-3773%2819980202%2937%3A1%2F2%3C75%3A%3AAID-ANIE75%3E3.0.CO%3B2-R|10.1002/(SICI)1521-3773(19980202)37:1/2<75::AID-ANIE75>3.0.CO;2-R]]. ^ IUPAC, Compendium of Chemical Terminology, 2nd ed. (the "Gold Book") (1997). オンライン版: (2006-) "hydrogen bond". ^ Desiraju, G. R.; Steiner, T. (1999). 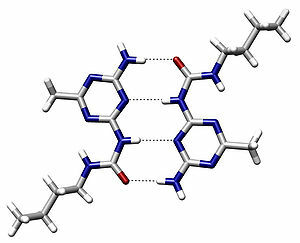 The Weak Hydrogen Bond: in Structural Chemistry and Biology. ICUr monographs on crystallography 9. Oxford: Oxford Univ. Press. ISBN 978-0198502524. ^ Emsley, J. (1980). “Very Strong Hydrogen Bonds”. Chem. Soc. Rev. 9: 91–124. doi:10.1039/cs9800900091. ^ Omer Markovitch and Noam Agmon (2007). “Structure and energetics of the hydronium hydration shells”. J. Phys. Chem. A 111 (12): 2253–2256. doi:10.1021/jp068960g. PMID 17388314. ^ A. C. Legon;D. J. Millen. (1987). Chem. Soc. Rev. 16: 467-498. doi:10.1039/CS9871600467. ^ Tom Sidney Moore and Thomas Field Winmill (1912). “CLXXVII.—The state of amines in aqueous solution”. J. Chem. Soc., Trans. 101: 1635. doi:10.1039/CT9120101635. ^ a b Wendell M. Latimer, Worth H. Rodebush (1920). “Polarity and ionization from the standpoint of the lewis theory of valence”. J. Am. Chem. Soc. 42 (7): 1419–1433. doi:10.1021/ja01452a015. ^ a b W. L. Jorgensen and J. D. Madura (1985). “Temperature and size dependence for Monte Carlo simulations of TIP4P water”. Mol. Phys. 56 (6): 1381. doi:10.1080/00268978500103111. ^ Jan Zielkiewicz (2005). “Structural properties of water: Comparison of the SPC, SPCE, TIP4P, and TIP5P models of water”. J. Chem. Phys. 123 (10): 104501. doi:10.1063/1.2018637. PMID 16178604. ^ Michel Baron, Sylviane Giorgi-Renault, Jean Renault, Patrick Mailliet, Daniel Carré et Jean Etienne (1984). “Hétérocycles à fonction quinone. V. Réaction anormale de la butanedione avec la diamino-1,2 anthraquinone; structure cristalline de la naphto [2,3-f] quinoxalinedione-7,12 obtenue”. Can. J. Chem. 62 (3): 526–530. doi:10.1139/v84-087. ^ Damien Laage and James T. Hynes (2006). “A Molecular Jump Mechanism for Water Reorientation”. Science 311 (5762): 832. doi:10.1126/science.1122154. PMID 16439623. ^ Omer Markovitch & Noam Agmon (2008). “The Distribution of Acceptor and Donor Hydrogen-Bonds in Bulk Liquid Water”. Molecular Physics 106: 485. doi:10.1080/00268970701877921. ^ a b R. H. Crabtree, Per E. M. Siegbahn, Odile Eisenstein, Arnold L. Rheingold, Thomas F. Koetzle (1996). “A New Intermolecular Interaction: UnconventionalHydrogen Bonds with Element−Hydride Bonds as ProtonAcceptor”. Acc. Chem. Res. 29 (7): 348–354. doi:10.1021/ar950150s. ^ E. D. Isaacs, A. Shukla, P. M. Platzman, D. R. Hamann, B. Barbiellini, and C. A. Tulk (1999). “Covalency of the Hydrogen Bond in Ice: A Direct X-Ray Measurement”. Phys. Rev. Lett. 82: 600-603. doi:10.1103/PhysRevLett.82.600. ^ Dingley, A. J.; Grzesiek, S. (1998). “Direct Observation of Hydrogen Bonds in Nucleic Acid Base Pairs by Internucleotide 2JNN Couplings”. J. Am. Chem. Soc. 120 (33): 8293–8297. doi:10.1021/ja981513x. ^ F. Cordier, M. Rogowski, S. Grzesiek and A. Bax (1999). “Observation of through-hydrogen-bond 2hJHC‘ in a perdeuterated protein”. J. Magn. Reson. 140 (2): 510–2. doi:10.1006/jmre.1999.1899. PMID 10497060. ^ Cordier, F.; Grzesiek, S. (1999). “Direct Observation of Hydrogen Bonds in Proteins by Interresidue 3hJNC‘ Scalar Couplings”. J. Am. Chem. Soc. 121 (7): 1601–1602. doi:10.1021/ja983945d. Robert H. Crabtree, Per E. M. Siegbahn, Odile Eisenstein, Arnold L. Rheingold, and Thomas F. Koetzle (1996). “A New Intermolecular Interaction: Unconventional Hydrogen Bonds with Element-Hydride Bonds as Proton Acceptor”. Acc. Chem. Res. 29 (7): 348–354. doi:10.1021/ar950150s. PMID 19904922. Alexander F. Goncharov, M. Riad Manaa, Joseph M. Zaug, Richard H. Gee, Laurence E. Fried, and Wren B. Montgomery (2005). “Polymerization of Formic Acid under High Pressure”. Phys. Rev. Lett. 94 (6): 065505. doi:10.1103/PhysRevLett.94.065505. PMID 15783746. R. Parthasarathi, V. Subramanian, N. Sathyamurthy (2006). “Hydrogen Bonding Without Borders: An Atoms-In-Molecules Perspective”. J. Phys. Chem. A 110 (10): 3349–3351. doi:10.1021/jp060571z. PMID 16526611. Z. Liu, G. Wang, Z. Li, R. Wang (2008). “Geometrical Preferences of the Hydrogen Bonds on Protein−Ligand Binding Interface Derived from Statistical Surveys and Quantum Mechanics Calculations”. J. Chem. Theory Comput. (A) 4 (11): 1959–1973. doi:10.1021/ct800267x. M. Goswami, E. Arunan (2009). “The Hydrogen bond: A Molecular Beam Microwave Spectroscopist's View with a Universal Appeal”. Phys. Chem. Chem. Phys. 11: 8974–8982. doi:10.1039/b907708a.